Kitchen set complete dicer slicer is made of ABS plastic. Chopper food salad cutter, 12 pieces: Multi Vegetable/Fruit/Tomato/Cheese/Onion/Potato ect. Chop vegetables within seconds without hassle and mess. 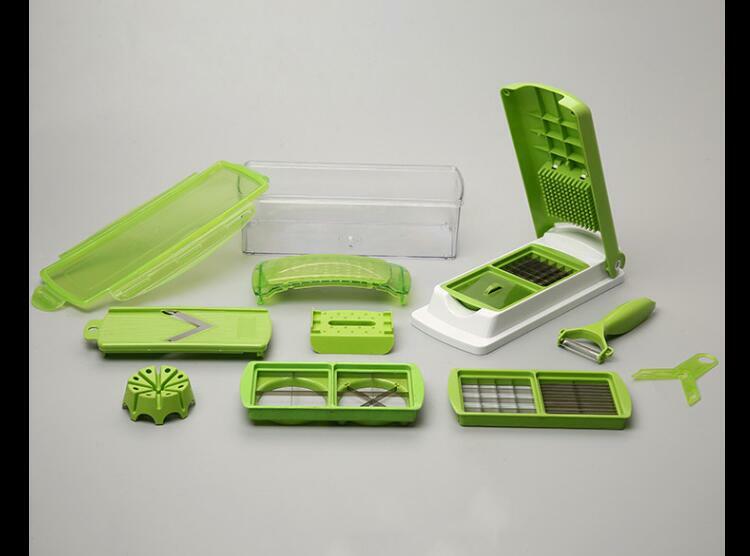 The Nicer Dicer Plus multi-chopper set has everything for cutting, dicing, grating, and slicing. Ultra-sharp blades made of stainless steel for precise and safe cuts. Easy cleaning with self-cleaning function under running water or in the dishwasher. Safe transport and storage of food with the fresh-keeping lid. 11 3/8" x 4 3/4" x 5 1/2"